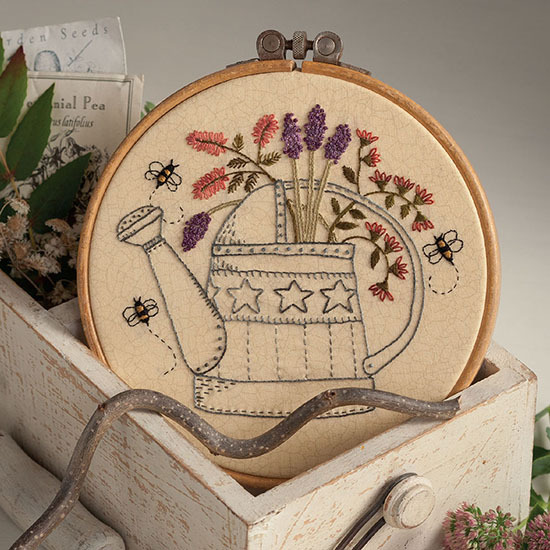 Indulge in the sentimental pleasures of stitcheries with wistful vintage artistry. Inspired by nature and stitched with the gentle romance of days gone by, noted artist Kathy Schmitz creates designs that use simple embroidery to create thoughtful keepsakes. Embroidery work is something women (and men) have done for many, many years. 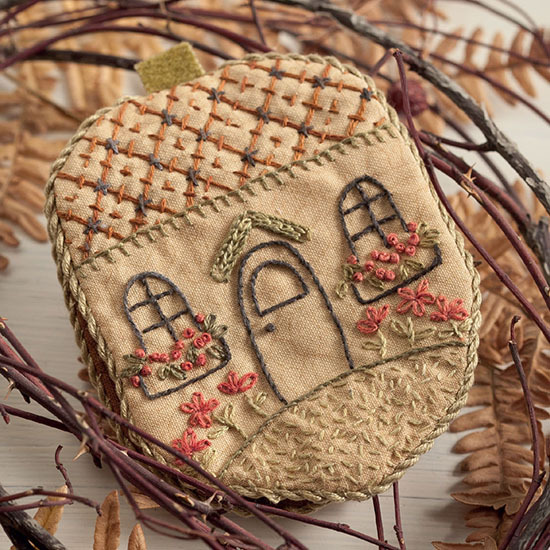 This book gives you 14 projects on which you can do embroidery. A one-page welcome from the author begins the book and the first project ties in with that as a welcome sampler. Included are all the templates needed to complete the particular project you want to make. 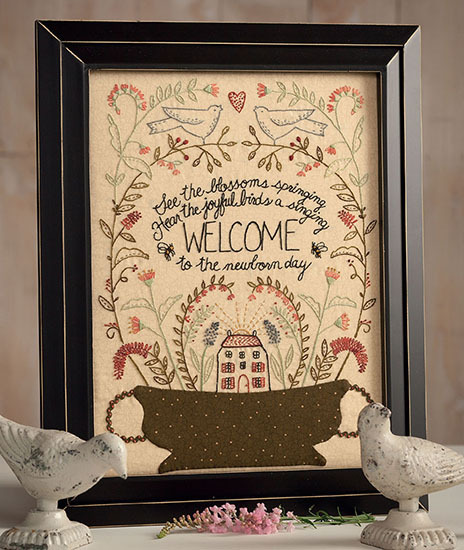 The charts of the embroidery design are even done in color so you don’t have to choose. Of course, you can use any colors you want but the author gives you an idea just in case you need a bit of help. 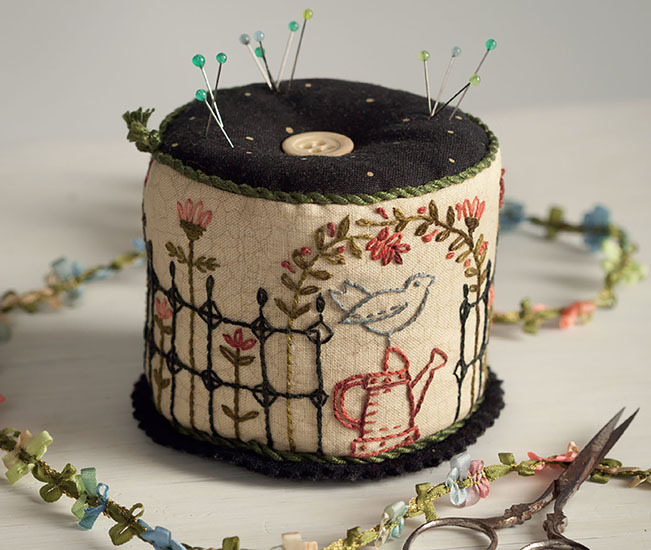 The patterns include a pincushion, a needle keeper, a wall hanging, a bag and others. In the embroidery section, there is even a chart of the DMC numbers that correspond to the floss color. 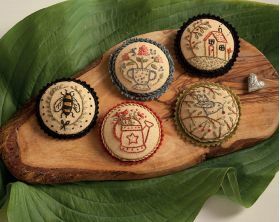 In this section are graphics of the individual embroidery stitches used for these projects. There is a short bio of the author at the end of the book. But before you get quite that far, there is a photo of a bird taking scraps of fabric from a suet cage. I knew the birds liked the bits of fabric but I never thought of using a suet cage so they could grab a bit and take it back to build their nest. Thanks to the author for helping me think outside the box. When I started going through its pages I was amazed at how dainty, how creative, and how easy-to-make the designs were. 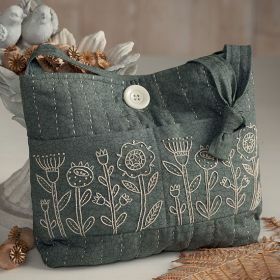 You can make them just as Kathy did or, like I did already, use her designs as inspiration for your own projects. 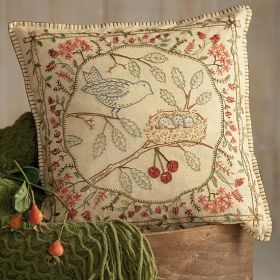 Kathy is a master at combining embroidery design and fabric. Pay attention to her choices and you can copy them while tailoring the elements (colors, textures) to your own taste. This book is a treasure trove of possibilities! 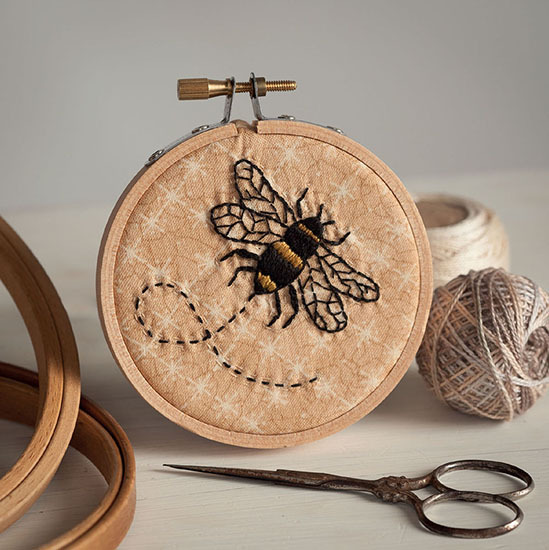 If you are into embroidery, or would like to learn, this is a must-have. 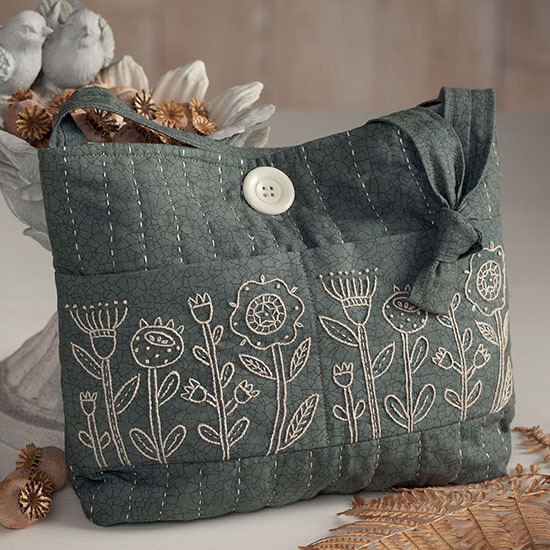 I am not a hand stitcher but this book makes me want to try some of the projects, the Bloom Bag caught my eye. 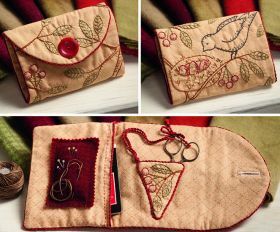 The great diagrams show how to create the stitches and by the way, who doesn't appreciate a hand stitched gift. 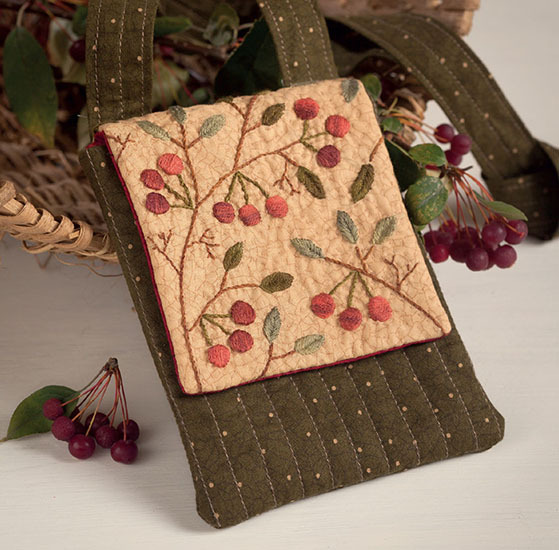 Whether you are new or a veteran in hand embroidering, everyone will find a project in this book that they just have to make. Si te gusta bordar y vas a comprarte un libro nuevo, éste es el que te sugiero. Desde que llegó a mis manos no he parado de hojearlo y ya comencé a reunir mis materiales para hacer el primer proyecto. El libro de Kathy Schmitz es un deleite a la vista y un deseo de hacer todos y cada uno de los trabajos que nos brinda. 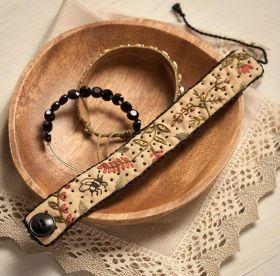 Todos sus diseños tienen un toque de nostalgia de tiempos pasados donde la vida tenía más instantes de paz que hoy en día. Me agrada mucho ver en cada proyecto los diseños preliminares donde me puedo imaginar a la autora que dibujó desde niña, haciendo bocetos en su mesa de trabajo y haciendo planes para brindarnos algo exquisito y delicado. Cada proyecto mezcla tanto bordado como appliqué, costura y acolchado. El cojín bordado de la portada es espectacular, además de servilletas, alfileteros muy originales, un par de hermosas bolsas de mano, caminos de mesa y otra serie de sorpresas. Los diseños están muy bien explicados y a tamaño natural. El libro incluye también una guía de puntadas de bordado que siempre es de utilidad.Tener el libro en tus manos es siempre una maravillosa sensación pero cabe explicar aquí que quien adquiere el libro en formato electrónico para su iPad o Kindle, recibe el enlace para tener acceso a todos los patrones y diagramas y así poder imprimirlos. Ambas opciones son maravillosas en nuestro mundo moderno. Translation: If you like embroidery and are going to buy a new book, this is what I suggest for you. Since I got my hands on it I have not stopped leafing and gathering my materials to make the first project. Kathy Schmitz's book is a delight to the eye and I desire to make each and every one of the projects provided. 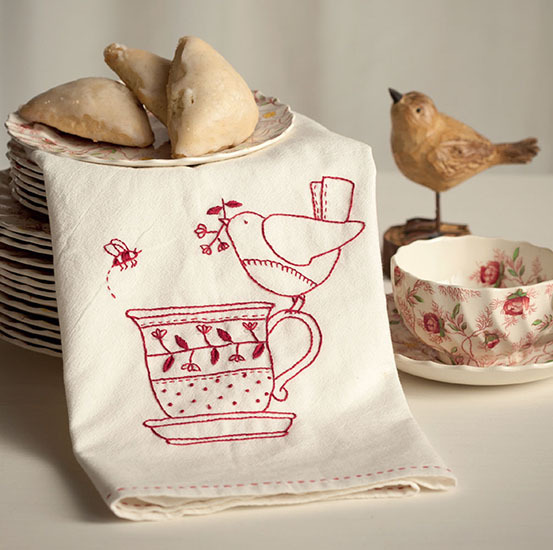 All designs have a touch of nostalgia for times past, when life had more moments of peace. I am very pleased to see each project's preliminary designs, where I can imagine that the author drew from childhood, sketching at her desk and making plans to give us something exquisite and delicate. 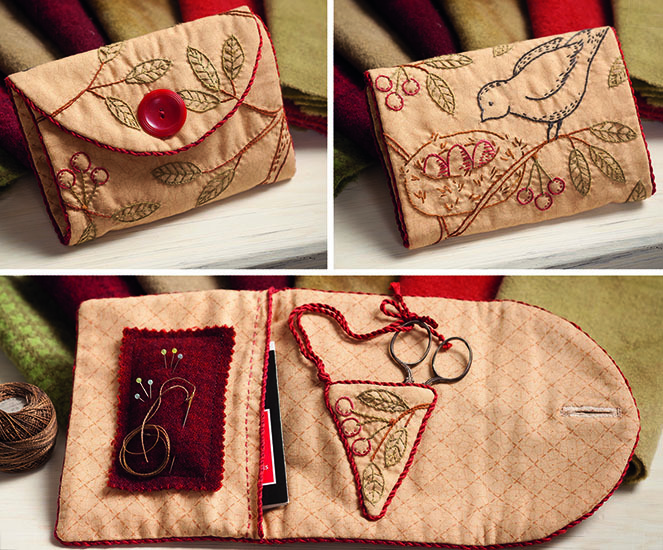 Each project is a mix of appliqué, embroidery, sewing, and quilting. 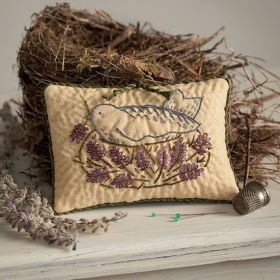 The embroidered cushion on the cover is spectacular, plus you'll find napkins, very original pincushions, a pair of beautiful handbags, a table runner, and a number of surprises. The designs are very well explained and life-size. 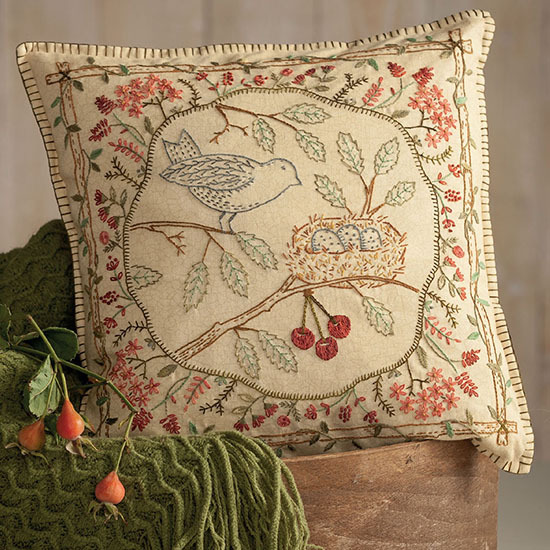 The book also includes a guide to embroidery stitches. To have the book in your hands is always a wonderful feeling, but whoever acquires the book in electronic format for your iPad or Kindle will receive a link to have access to all patterns and diagrams so you can print them. Both options are wonderful in our modern world. Expert quilter Kathy Schmitz (founder of the pattern company Kathy Schmitz Studio) presents Stitches from the Garden: Hand Embroidery Inspired by Nature, a medley of embroidery projects inspired by [the] charm and wonder of nature. 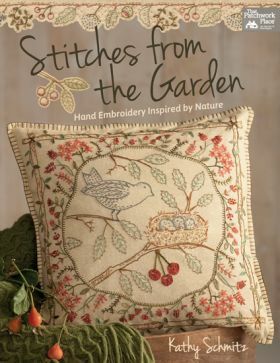 Filled with full-color photography, traceable embroidery patterns based on Schmitz's hand-drawn artwork, reader-friendly step-by-step instructions, and supplemented with a helpful diagram of embroidery stitches, Stitches from the Garden is a treasure trove of inspiration for needlecrafters! Highly recommended. Stitches from the Garden: Hand Embroidery Inspired by Nature is a fine collection of hand embroidered works that uses easy embroidery [and] basic techniques to create keepsake pieces from tote bags and pincushions to notions keepers and more. The look says 'vintage' but the techniques incorporate embroidery designs and approaches designed to streamline results and produce the best professional-looking results. 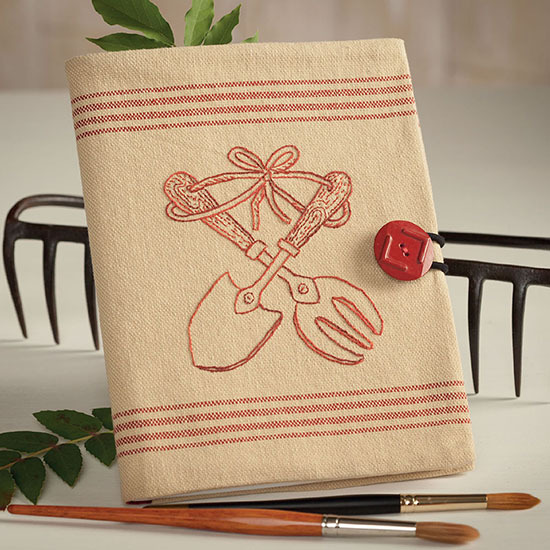 Any who want to blend nature and garden images with useful gifts and projects that support sewing materials will find this an excellent collection. I have been pouring over this beautiful book! There are lots of sweet little projects in the book, lots of inspiration, and as a surprise (to me) the embroidery projects are simple enough for someone like me who is a beginner, and I love the color that Kathy has added to her projects in the book too. Kathy's sweet artwork is so nicely presented. There is a nice variety of projects in Stitches from the Garden. The illustrations in this book are beautifully done and the stitching directions are very clear. I think I will only have trouble deciding which projects to work on first! But for right now, I love looking at this book on my coffee table. 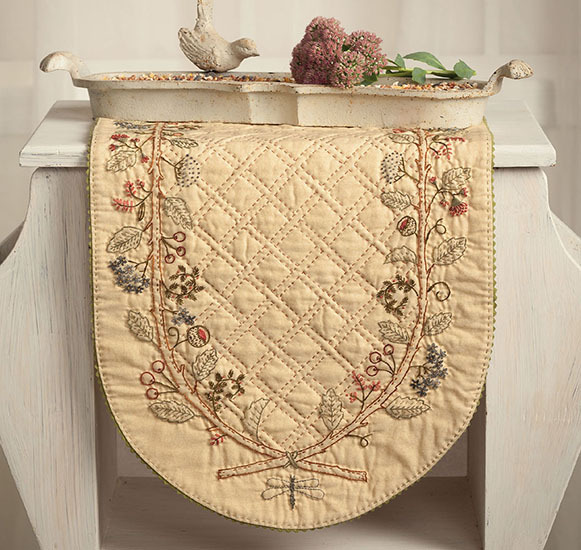 Kathy Schmitz made her first quilt at age 13 on her grandmother's treadle sewing machine. She grew up drawing, painting, and sewing, and went on to become a graphic designer. In 2002 she founded Kathy Schmitz Studio, and her illustrations were a huge success. 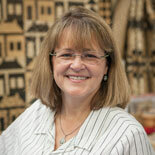 Kathy has designed fabric for Moda since 2002 and has had her own pattern company since 2007. See the latest at KathySchmitz.com.